Starlight Theatre’s 33rd Annual Benefit Gala is moving to October! Mark your calendars for Saturday night, October 12, 2019 to attend this highly anticipated and entertaining annual event. John and Bridget Murphy will serve as the event’s Chairs. Guests of Starlight’s Annual Benefit Gala enjoy cocktails and hors d’oeuvres under the stars, a delicious multi-course dinner in the stage house and surprise live entertainment. Gala attendees will also be the first to witness the exciting reveal of Starlight’s 2020 Broadway season! The event will also present a local community advocate with the 2019 Star Award for their commitment to Starlight and support of important causes throughout our community. The 2018 Starlight Gala featured a surprise live performance from the Broadway cast of Beautiful – The Carole King Musical and grossed more than $625,000 to support Starlight’s education and outreach efforts, Broadway programming and theatre operations. 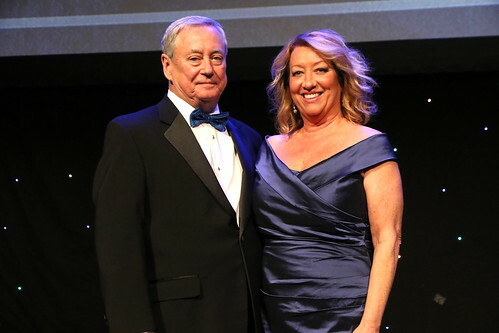 We remain grateful to Jean and Don Wagner and the Deramus Family for their leadership as our 2018 Gala Chairs and for helping Starlight to raise these critical funds. With their help and the support of our many sponsors and guests, Starlight Theatre will continue to shine for decades to come. For sponsorship information, please contact Megan McCranie, Donor Database Specialist at 816.997.1153 or megan.mccranie@kcstarlight.com. Guest Names: If Starlight does not have your guest names, please email those names to Megan McCranie at megan.mccranie@kcstarlight.com as soon as possible. Dietary Restrictions: If any of your guests have any special dietary restrictions, please call 816.997.1153 or email megan.mccranie@kcstarlight.com know as soon as possible. Parking: Complimentary valet parking is available outside of Gate 7 on the east side of Starlight. If you are unable to attend or would like to make an additional gift, you may do so here. This list reflects donations to the 2018 Gala made through September 22, 2018.